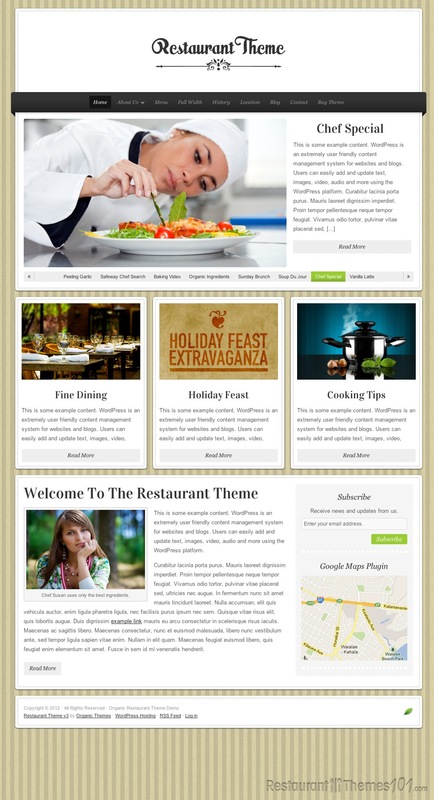 Restaurant Theme is a WordPress restaurant theme from Organic Themes, which also works perfectly as a WordPress cafe theme. 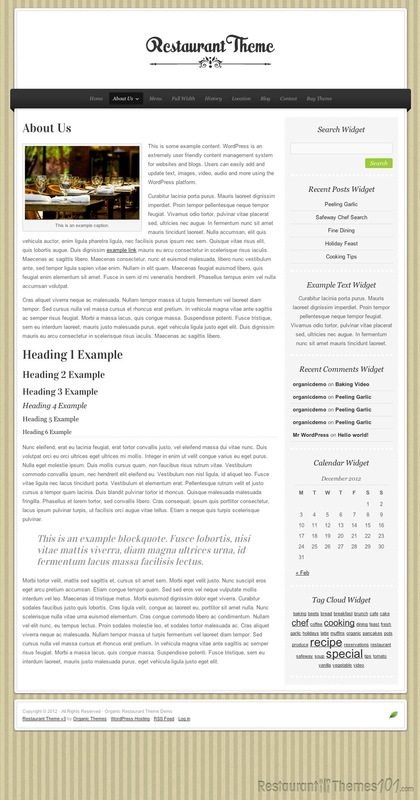 In fact, with a few tweaks, this theme could work for virtually any type of website. It has the feel of a blog, with the functionality of a full-fledged website. With YouTube compatibility and a user-friendly layout (both on the frontend and backend), this theme could easily be used for a food blog, cooking blog, or a number of other things. When you view the demo, you will notice that a YouTube video is highlighted at the top of the page. In that position, you can choose to display a video, a static picture, or a sliding picture gallery. Directly above this video/image gallery is the options menu, where readers can navigate to the section/page they are looking for. Under the video is a section for content, highlighted with image thumbnails. For a food blog, this is where you could place your featured articles. For a restaurant website, this is where you could display your menus, with thumbnails of your delicious dishes to draw in the readers attention. Beneath this section is a large space for a featured article, About Us description, or whatever else you choose to display. To the right of this is a Google Maps plugin to display your location, and a place to subscribe to an RSS feed or email newsletter. As far as features go, Restaurant Theme offers a food menu template, Google Fonts compatibility, custom header, background, and menu options, several color change options, a featured slider/image gallery, custom page templates, and the full Photoshop design file. This theme is also compatible with most 3rd-party widgets, which means you can customize the functionality of your site even further once you have exhausted the options that are built in to this theme.